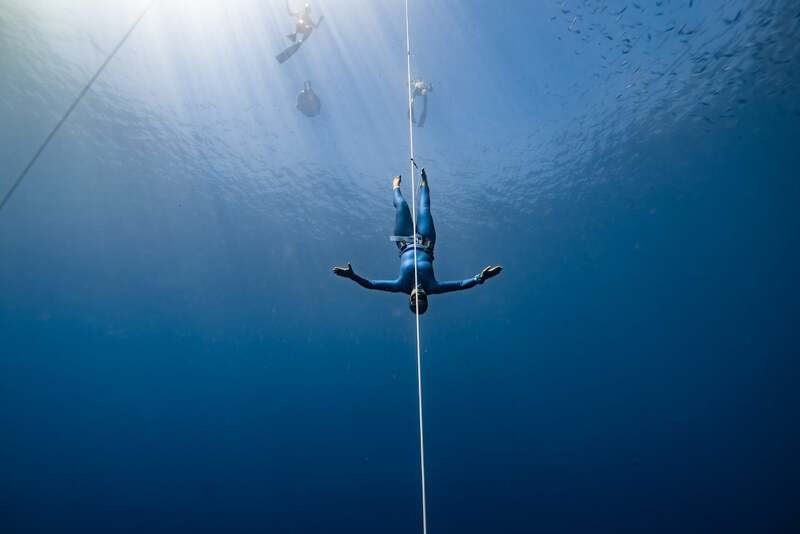 The second edition of freediving competition Blue Element wrapped on Friday 30 November. The 6-day event ran from 23-30 November and was organised by Jonathan Sunnex, AKA Johnny Deep and Sofía Gómez Uribe, a formidable partnership as both are recognized as one the deepest male and female freedivers in the world – Sofia is a former World Record holder in bi-fins and a multi-national record holder in both pool and depth and Johnny dives below 100m in CWT and FIM. 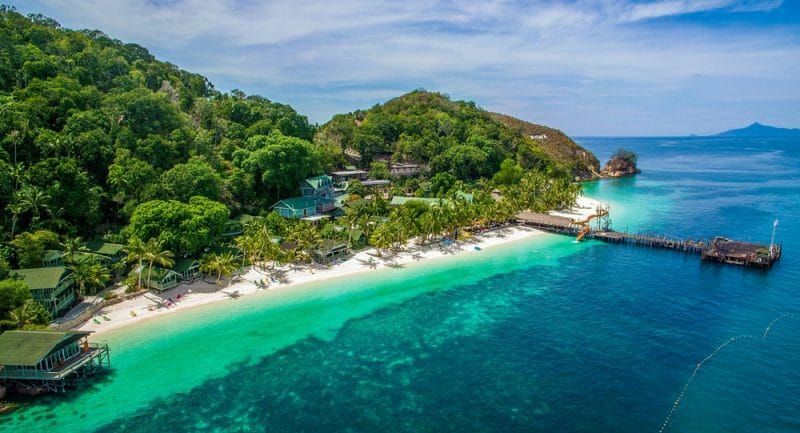 Set in Soufriere Bay, Dominica the diving conditions are pretty hard to beat, the water temperature doesn’t go below 26 degrees, there is no current, no waves and the visibility is 20-30m. 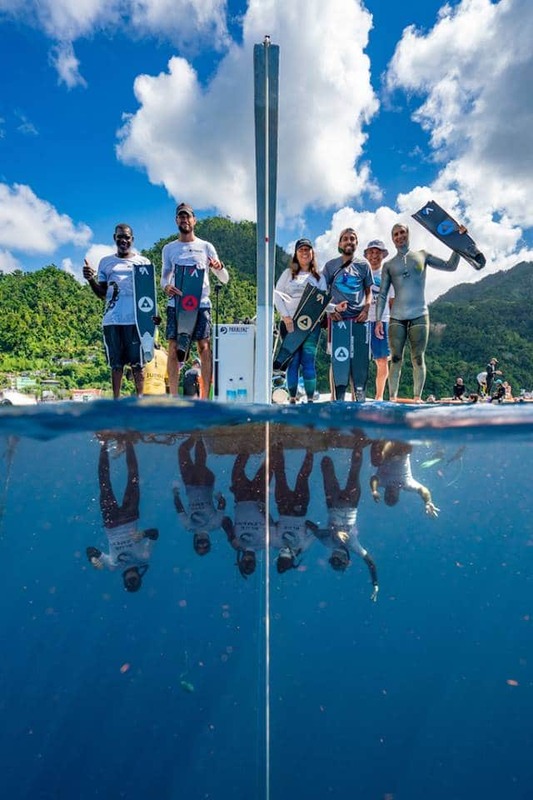 Twenty-two athletes from thirteen countries crossed the globe to compete before laying their fins down to rest and then starting all over again next year. World record holders and national record holders competed on the same line as beginners and a total of twenty national records fell. The winners of the competition were Sayuri Kinoshita of Japan and Stig Pryds of Denmark. 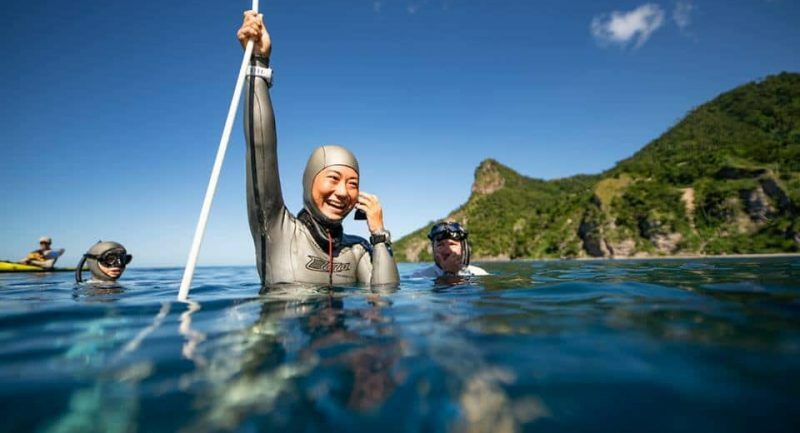 Sayuri’s top dives were 83m CWT bi-fins, 98m CWT, 88m FIM, 62m CNF and Stig’s were 101m CWT, 95m FIM, 68m CNF. Sayuri is the current FIM world record holder (97m) and former CNF world record holder (72m). Stig Pryds holds all Danish depth national records at present (75m CNF, 102m FIM, 105m CWT). Stig suffers from psoriatic arthritis (a chronic inflammatory joint disease, causing intense pain and extreme fatigue), making his diving results all the more impressive and inspiring. Also impressive and worthy of a mention is that in-between organising, Sofia and Johnny snuck in some dives of their own securing spots on the podium: Sofia came second overall (80m CWT, 85m FIM, 52m CNF) and Johnny third (82m CWT, 80m FIM and 52m CNF), quite remarkable and testament to what a well-run competition Blue Element was that they were able to transition between roles. We had four freedivers representing the UK who all did themselves proud. Nancy Gibson placed fourth overall with dives to 60m CWT (bi-fins), 60m FIM and 40m CNF and Georgina Miller came sixth (56m CWT, 47m FIM and 36m CNF); Paul Sutton came fifth out of the men (61m CWT, 56m FIM, 51m CNF) and Jon Fane sixth despite only competing in two out of three disciplines (77m for both CWT (bi-fins) and FIM). Safety is paramount to Johnny and Sofia and the members of the Safety Team were selected for their experience and capabilities, arriving early to train and building a team together. The team worked with medics to learn the most up to date procedures when dealing with potential emergencies. 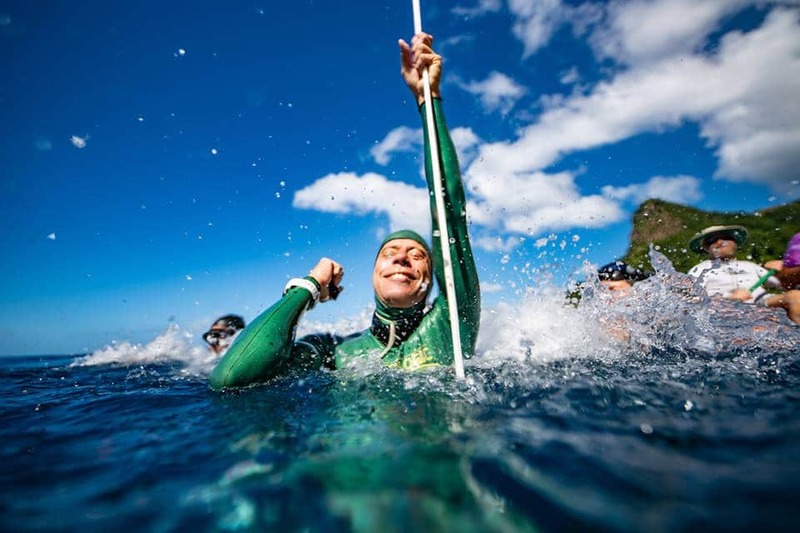 British freediver Louisa Collyns, a former GB freediving athlete and instructor led the team as Chief of Safety. Also on the team were Gary McGrath, a team GB competitor and instructor and Scottish freediver and Yoga Instructor Lynne Padden. Also a priority is conservation and on one of the rest days, Sofia with the support of Maaji Earth Warriors (who do beach clean ups all over Colombia) and help from the Blue Element crew and athletes, collected over 200 kilos of trash in just half an hour. This is a tradition that will continue with each Blue Element edition. 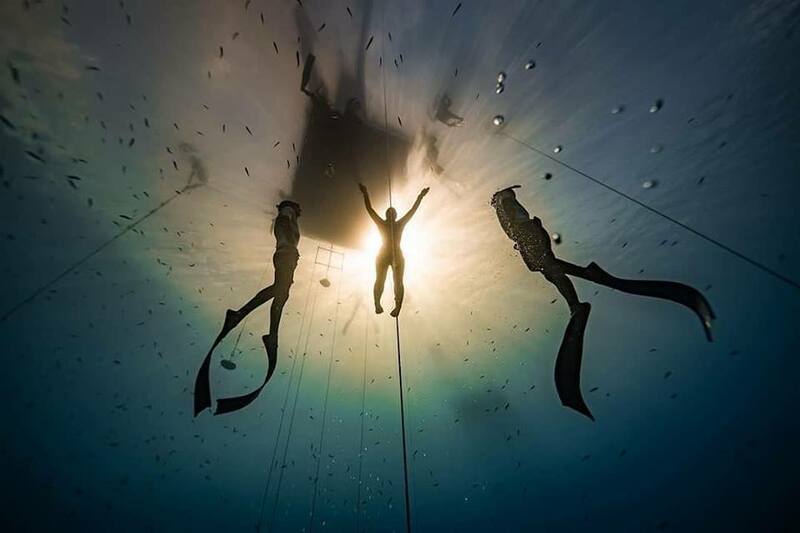 Check out www.britishfreediving.org to find out more about freediving.